Urban Canadians think about parks a lot this time of year, but city parks are also sites of year-round activity, planning, and protest. This is the first of two posts on the landscapes and urban environments of Montreal, contributed by students from McGill’s Canadian Studies 405: Canadian Environments, Past and Present. The course was instructed by Claire Campbell, the Eakin Fellow in Canadian Studies, and it asked students to reflect on a site in Montreal that they felt embodies an interesting and important component of Canadian environmental history. In this piece, Alec Angle writes about Montreal’s former “Dominion Square” (now Dorchester Square and Place du Canada). This was at one point a peripheral green space, but it became a symbolic landscape and the site of political and cultural protests throughout the twentieth century, culminating most recently with the 2012 student protests. 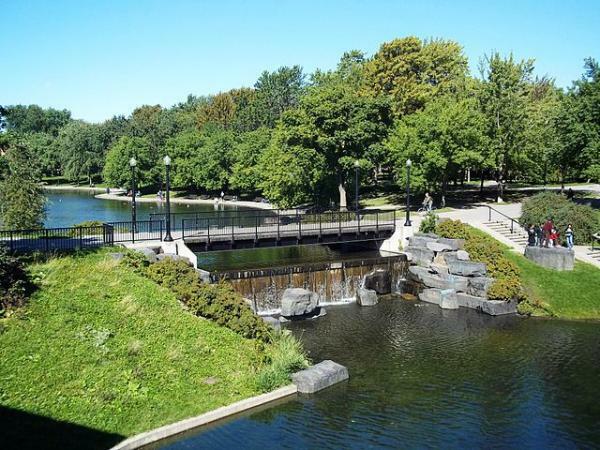 Colleen Morawetz writes about Parc LaFontaine and its surroundings, places that connect the most densely populated neighbourhood in Canada with recreational spaces and constructed ideas of nature. The next post will move up the mountain, with two discussions of Mount Royal and its hydrological resources. Excerpt from Alec Angle, “Claimed but Untamed: Montreal’s Former Dominion Square.” For the full paper from Canadian Studies 405 (McGill, April 2013) see the PDF below. … Dominion Square emerged as the “built form” of a decision made as commerce met a technological impasse; the resulting space was defined by the potential for exchange and dialogue, but undergirded by a countervailing unease. Indeed, the subsequent evolution of the square has been characterized by a heated symbolic dialogue between Montreal’s anglophone and francophone communities. What follows is a very brief chronicle of the additions to the square that I would argue constituted significant attempts to project culture into the space through the use of symbols. In 1870, Bishop Ignace Bourget laid the cornerstone for a new cathedral at the corner of what is today the Boulevard René Levesque and (appropriately) De la Cathédrale. St. James Cathedral, consecrated in 1895, was modeled after that of St. Peter in Rome but was crowned with statues from among Montreal’s patron saints rather than statues of Christ and the Apostles. In response, between 1875 and 1930, Dominion Square was gradually encircled by the massive Windsor Hotel (1878/1908, to the West), the Sun Life Building (1914-1930, to the East) and the Dominion Square Building (1930, to the North). If this architectural pincer around the Square was not enough to establish a British imperial presence, then the statue of Sir John A. Macdonald erected in 1895 (facing his territorial ambitions to the North-West) added somewhat; the Queen Victoria Jubilee monument in 1898 added considerably; and the Boer War monument erected in 1907 added immensely. Anglo-Canadian capital dominated the square throughout this period. As Quebecois nationalist agitation gained momentum in the 1950s and 60s, however, its influence also manifested itself in Dominion Square. A monument to Wilfrid Laurier was erected in 1953. Laurier was made to stare straight at Macdonald, or perhaps over him, toward the United States. In 1967, at the height of the Quiet Revolution, Dominion Square was partitioned into Place du Canada (below Dorchester/René Levesque) and Dorchester Square (above). René Levesque, the fall of whose government is often taken to mark the end of the Quiet Revolution, later gave his name to replace that of Lord Dorchester on the street intersecting the square. The name given to a place, as Jacques Fortin points out, “souligne son appropriation et son apprivoisement par la population qui l’habite et par l’administration qui gère ce même espace”. The result, as it is today, is a hotly contested urban palimpsest, an ostensibly open space that in fact houses a constellation of potent, nearly militant, symbols and names: the “built forms” of clashing cultural ambitions. The symbolic saturation of the square has made it a desirable venue for political and social discourse. Collard notes that John A. Macdonald made a campaign stop in Dominion Square in 1878. More recently, in 1995, the park hosted a massive gathering of federalist demonstrators who, on the eve of Quebec’s sovereignty referendum, attempted to shift the balance of the vote with a Unity Rally in Place du Canada. Even more recently, student protesters donned red squares and blue flags in a push for accessible education that took a decidedly nationalistic tone. Dominion Square, as a space which invites the creation of new meaning, continues to attract those who would rewrite its ideological landscape with new symbols. What then does this suggest for our understanding of public spaces moving forward? Excerpt from Colleen Morawetz, “Recreational Spaces Reflecting Dominant Ethos: A Case Study of Parc LaFontaine and its Surroundings.” For the full paper from Canadian Studies 405 (McGill, April 2013) see the PDF below. In the heart of the Plateau Mont-Royal, Parc LaFontaine boasts an impressive array of cultural features. The cultivated landscape is home to such seasonal attractions as two manmade ponds accented by a fountain, skating rinks, bike paths, outdoor swimming pools, playing fields, and the adaptable Théâtre de Verdure, as well as to prominent monuments honouring Adam Dollard des Ormeaux and Louis-Hippolyte LaFontaine. These distinct features have been added in stages over the park’s history, literally building on each other and reflecting evolving dominant ideology about the role of urban parkland. Parc LaFontaine is perhaps best characterized as a built “natural” environment, one that attempts to connect the inhabitants of the Plateau, the most densely populated neighbourhood in Canada, to “natural” green spaces within the city limits. However, the true significance of the park as a built environment can only be grasped in the context of the historical evolution of the city and the evolving character of the neighbourhood. In this brief overview, I will touch on the parkland/urban spaces dichotomy of recreational land use in the Plateau and discuss what these historical lessons may mean for contemporary policy questions. In his 1979 article, Peter Jacobs provides a stage-based historical overview of parks development in Montreal. The first period, characterized as the transition of “private gardens to public parks”, is exemplified by the City of Montreal renting what is now Parc LaFontaine in 1874 to make the space an urban recreation centre. The land had been held by the colonial government as a military parade ground; prior to its 1845 sale to the colony of Canada, it had belonged to the family of James Logan as a farm far outside the existing city. “Logan Park” was eventually renamed around the time of the city’s re-division of districts, when the LaFontaine (now Plateau) neighbourhood was delineated. Jacobs situates this initial stage within the wider history of Montreal institutions. He argues that when the function of the city reflected an administrative and religious character, built “green” spaces generally took the form of private, cultivated, walled courtyards. The transitional phase within which Logan Park was rented and turned into public space corresponded to the development of “conscious urban recreation” in a city whose identity was morphing into a “centre of commerce and industry.” The physical landscape of the city, as manifested in parks projects, reflected dominant cultural identities of what urban recreation areas should be provided for inhabitants to maintain a balance between “nature” and the city. This process, in the dominant social ideas of the time, was thought to foster a sense of “social democracy” and urban camaraderie. Parc LaFontaine’s Théâtre de Verdure, built in 1947, exemplifies the second of Jacobs’ stages – “The greening of the grid”. The demography of Montreal’s neighbourhoods changed dramatically during the mid 20th century, as was the case in most Canadian cities. If we disregard contingencies unique to Montreal, the migration of middle class families beyond the original city limits and towards the “healthier” suburbs was a general trend in cities throughout the country. Jacobs argues that this rapid expansion of Montreal beyond parkland once on the outer city limits (including parks such as LaFontaine and Mont-Royal) was countered by city planning to “revitalize” urban parks in an increasingly large, gridded city. Cultural festivals, artistic exhibitions, and other “family-friendly” infrastructure were institutionalized in urban parkland as a way for city-dwellers to connect with “nature” and culture within the densely populated city. Jacobs argues that this stage, which saw the creation of Parc LaFontaine’s popular theatre and sports facilities, constituted the end of the city’s “greening period”. In short, much of Montreal’s urban parkland, including the carefully cultivated Parc LaFontaine, reflects city planning techniques and dominant urban ethos up to and including that of the mid-20th century. Alec Angle and Colleen Morawetz were students in Claire Campbell’s Canadian Studies 405: Canadian Environments, Past and Present, at McGill University in the Winter of 2013. Edgar Andrew Collard, The Story of Dominion Square-Place du Canada (Ontario: Longman Canada Ltd., 1971), 15-17, 20-49. To call this a “separation” would far too controversial in light of subsequent events in Dominion Square. Jacques Fortin, “La toponymie, un mode d’appropriation dans la nomenclature de l’île de Montréal,” in Montréal: Tableaux d’un espace en transformation, ed. Frank W. Remiggi (Montreal: ACFAS, 1992), 473. Collard, The Story of Dominion Square-Place du Canada: 13. See for example Mario Cardinal, Breaking Point Quebec-Canada: The 1995 Referendum (Montreal: Bayard, 2005). The Montreal Gazette provides a strong running account of the 2012 student strikes in Montreal. The National Post and Maclean’s Magazine emphasized the nationalist tone but, at times, overemphasized it. Montreal.com. “LaFontaine Park.” Accessed March 1, 2013.http://www.montreal.com/parks/lafontaine.html. Laterreur, Isabelle, Marlène Schwartz, Claude Laurin, and Susan Bronson. “Montreal’s Plateau Mont-Royal Borough: an Innovative Approach to Conserving and Enhancing an Historic Urban Neighbourhood.” City & Time 4, no. 1 (2008). Jacobs, Peter. 1979. “Beyond parks: Stages in the innovation and re-creation of the city of Montreal”. Landscape Planning. 6 (2): 225-235.